Wolter A.M. te Riele was born in Deventer on the 8th of September 1867 as the son of G. te Riele (1833-1911), a carpenter by profession who had become an architect in ca. 1866 and who had since designed ca. 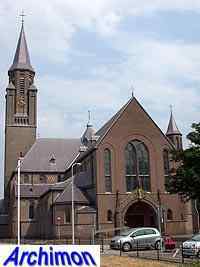 20 Roman Catholic churches, mostly in the provinces of Gelderland and Overijssel. Wolter first learned his skills from his father and from 1886 until 1889 studied at the St. Lucasschool in Gent (Belgium), a catholic school for religious art. After graduating in 1889 he became an apprentice at P.J.H. Cuypers' office in Amsterdam. He completed his study in England with a course about medieval art. 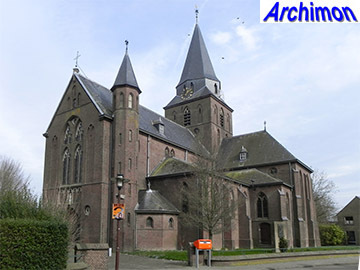 After returning to the Netherlands in 1890 he worked as an architect with his father until 1902, and then started his own office in Deventer, at first mostly working as a restoration architect. 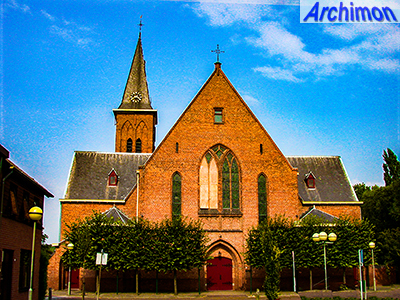 In 1912 he opened a second office in Nijmegen, hoping to get assignments in the 's-Hertogenbosch diocese. The first decade of his career Te Riele mainly designed houses and other non-religious buildings. 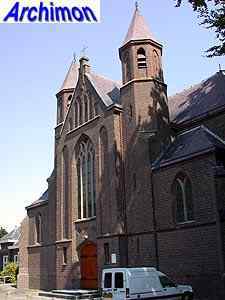 His first assignment for a church design came in 1901, for a church in Almelo, which was soon followed by a church in Delden, near Arnhem. 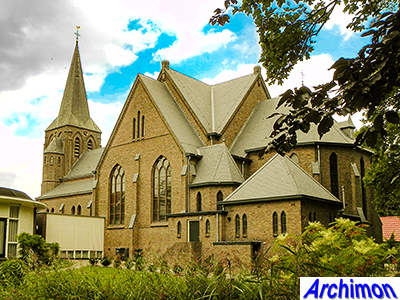 Within a few years he became one of the major architects of the archdiocese of Utrecht, but although he also had some assignments outside the archdiocese, Te Riele's Nijmegen office was relatively unsuccesful and by 1918 it was closed. In 1918 Te Riele moved to the city of Utrecht, to a new office on a location near the palace of the archbishop. 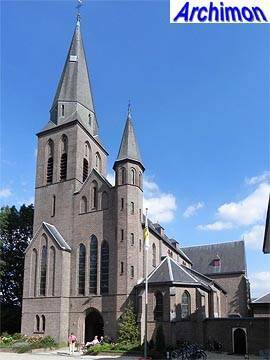 Te Riele was the last important architect of neo-Gothic in the Netherlands, and between 1901 and 1934 he built or extended more than 80 churches all over the Netherlands, with the exception of the province of Limburg, and also had several assigments outside his country. Although his style always remained neo-Gothic, it did evolve and there were innovations throughout his career. 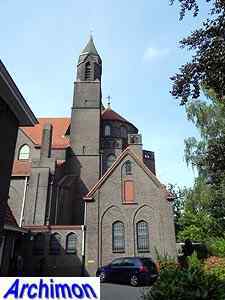 At first his work, like that of his father, conformed to the rules of the St. Bernulphus Guild and was closely related to that of Alfred Tepe's work, inspired by Lower Rhine Gothic and based on the use of brick. After ca. 1910 there were influences from other styles. New views on liturgy urged Te Riele, like so many of his colleagues, to develop different types of ground plans, resulting in a series of more or less centralizing churches. A recurring element in his work is the square tower with a short octagonal upper part with corner turrets. Another is the use of brick vaults. Brickwork in the interior was at first plastered but after ca. 1920 left visible. After 1912 the traditional clerestorey was often replaced by a series of brick dormer windows that extended from the walls of the central aisle. After moving to Utrecht in 1918, he added decorative elements that were, and sometimes still are, the subject of criticism. Critics often regard this later part of his career as not his best. Until the early 1930's Te Riele continued to design in this modernized neo-Gothic style. He died in Utrecht on the 13th of February 1937. The following is a list of his religious work mostly. It is not complete but does include all of his known churches. Building in neo-Renaissance style. The original building was designed by G. te Riele and built in 1874. Te Riele's first church. Big three-aisled cruciform church in neo-Gothic style. Polygonal transept-arms. Probably his only church with flying buttresses. Tower built in 1903. 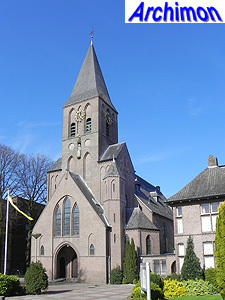 Three-aisled church in neo-Gothic style, with front tower. The announcement for the tender mentioned both G. te Riele and W. te Riele as architects. Destroyed in WW2. No further details. Small three-aisled church in neo-Gothic style. Wide central aisle, narrow side-aisles. Large cruciform basilica in neo-Gothic style. Built in three stages; in 1902-1904 the choir and transept were built. The nave was added in 1915 as well as the lower part of the tower, which was completed to the height of the nave. 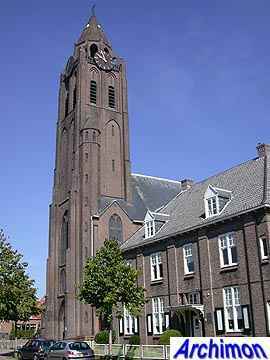 In 1934 the tower was completed by architect A. Vosman. Three-aisled church in neo-Gothic style. Like the church in Hertme it had a wide central aisle and narrow side-aisles. In 1920 the church was extended with wider side-aisles. Addition of side-aisles to A. Tepe's first church. Church demolished in 1966. Proposal only, not executed. Te Riele would have added a polygonal turret to the front of the church, basically nothing more than the choir of an otherwise demolished Gothic church. Basilican church in neo-Gothic style. 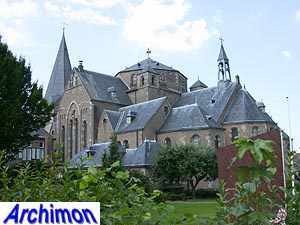 Te Riele was forced to abandon the direction he took with his previous churches in Hertme and Luttenberg and gave this church a nave and side-aisles of more traditional width. Restoration of a Gothic church. Included the eplacement of the roof by a new one, designed by Te Riele. 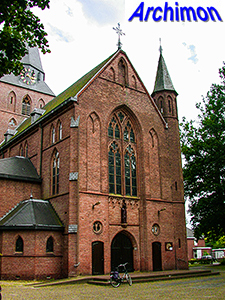 New choir with lateral chapels and transept in neo-Gothic style for an older church in neo-Classical style. 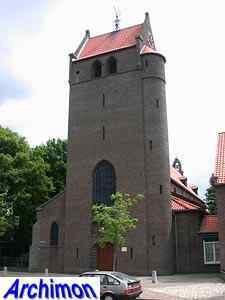 In 1928 Te Riele designed a tower for the same church, but it was not built. Three-aisled cruciform basilica with wide side-aisles. Front flanked by stair-turrets. Destroyed in 1944. Destroyed 1944. No further details. Incl. new windows in neo-Gothic style. 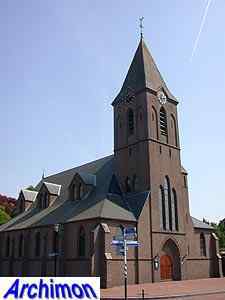 Te Riele's only protestant church. Small cruciform church with centralizing ground-plan. Te Riele was originally hired to restore the old church in this village, but when this building was beyond repair he designed a new one instead. Neo-Gothic cruciform basilican church with centralizing ground-plan. New transept for an older church by A. Tepe. New facade for a former barn church. 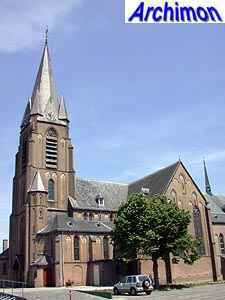 Neo-Gothic church with centralizing ground-plan. Aisleless cruciform church in neo-Gothic style, with square tower. Extension of a medieval church, with new traves, side-aisles, transept, crossing and choir in neo-Gothic style. Cruciform church in neo-Gothic style, with square crossing-tower. Restoration of a mostly late-Gothic church. 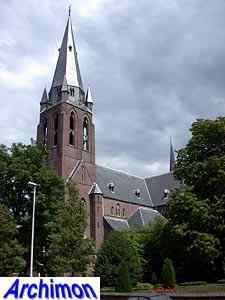 Three-aisled neo-Gothic basilica with tower. Damaged by bombs in 1943 and replaced by a new church in 1952. Large three-aisled cruciform basilica in neo-Gothic style. Small, towerless three-aisled cruciform basilica in neo-Gothic style. Low transept-arms. Restoration of a Gothic church. No further details. Three-aisled pseudo-basilica in neo-Gothic style, with square tower. 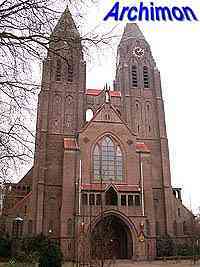 Three-aisled neo-Gothic church. Tower next to the front. Three-aisled cruciform basilica in neo-Gothic style. Badly damaged by artillery in 1945; the originally tall tower was rebuilt differently and shorter. Three-aisled cruciform basilica in neo-Gothic style. Extended in 1956 by architect C. Geenen. Cruciform church in neo-Gothic style. Designed in 1913. Work started in 1914 but was temporarily interrupted due to World War One. Completed in 1915. 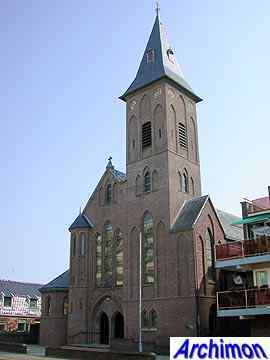 Church in neo-Gothic style with centralizing ground plan. Wide main space with tall roof. Tower at the side of the front. 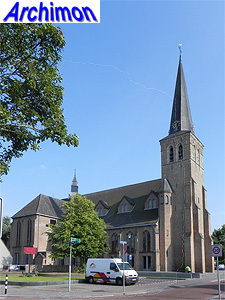 Replaced by a new church (by J. Cuypers and P. Cuypers jr.), except for the tower, in 1938-1939. Restoration of a Gothic tower. no further details. 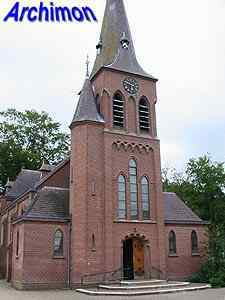 Extension in neo-Gothic style of an older church. 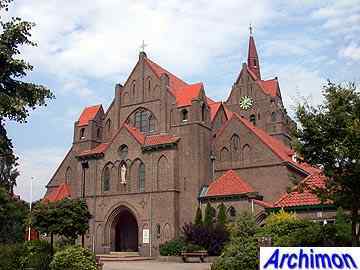 Three-aisled cruciform church in neo-Gothic style with centralizing ground plan. Tower at the side, wide main space. Possibly a Gothic choir was incorporated. Nave added to the choir and transept from 1902-1904. Basilican cruciform church in neo-Gothic style. The church was built on the slope of a hill; the space underneath the choir was used for a presbytery. Cruciform church with a centralizing ground-plan, with a wide transept and nave forming a Greek cross. Demolished in 1964. Built or not? 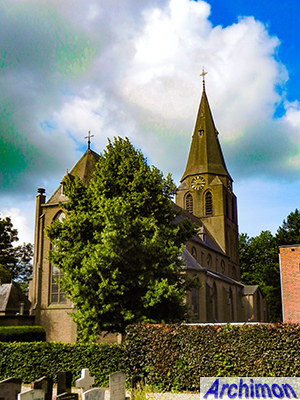 In May 1916 Te Riele advertised the tender for the construction of a church and presbytery in De Hoef. 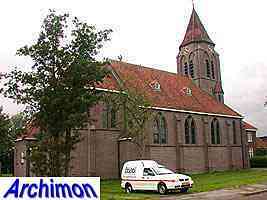 Some sources attribute the church to J. Etmans, and it's supposedly built in 1921. It's a small building in neo-Gothic style in the shape of a Greek cross, and the design may well have been by Te Riele. Three-aisled cruciform basilica with westwork and pseudo-transept at the front. The octagonal tower at the westwork was removed in the 1920's due to constructional faults. Neo-Gothic pseudo-basilican church with westwork. Restoration of the tower of a medieval church. Te Riele restored the nave in 1927-1928. Restoration of a medieval church. Three-aisled basilica in neo-Gothic style. Originally two traves long. A third trave was added in 1932-1933, followed by a tower with a saddle-roof. Design for a chapel for the exiled German emperor Wilhelm II. Not built. Church extended with wide side-aisles with seperate roofs, turning the church into a hall-church. Garrisson church. 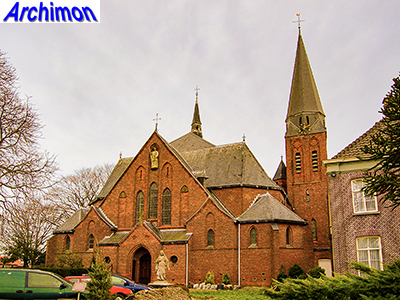 Three-aisled church with four brick dormer windows on each side instead of a clerestorey. Portal at the front could have been intended as the lower part of a tower. Church destroyed in September 1944. 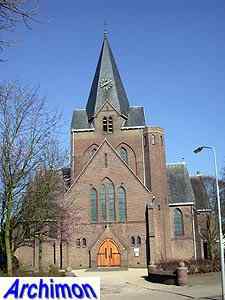 Three-aisled church with four brick dormer windows on each side instead of a clerestorey. 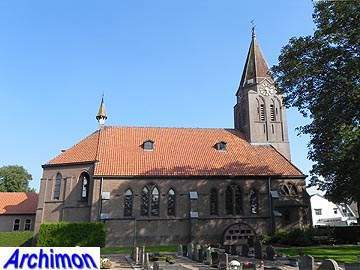 Very similar to the church in Ede from the same period. Three-aisled cruciform church with octagonal crossing-tower marking the choir. Nave with brick dormer windows. Three-aisled hall-church in neo-Gothic style. Wide side-aisles of three traves each, each with a pointed gable. Tower next to the choir. Neo-Gothic three-aisled cruciform basilican church, incorporating a medieval tower. Nave with dormer windows. Rebuilt into a community center in 2014. School in simple neo-Gothic style. Three aisled cruciform church with rectangular choir. Square tower with octagonal upper part. Closed in 1972 and demolished in 1977. 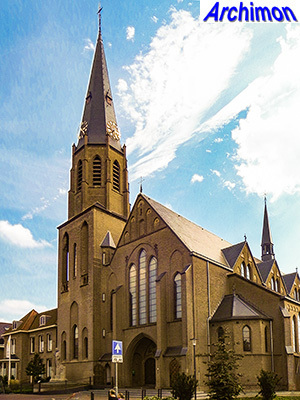 Addition of a new transept and choir to a neo-Gothic church by A. Tepe. 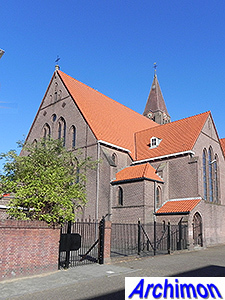 Three-aisled cuciform church in late neo-Gothic style. Wide side-aisles covered by seperate roofs. Built in two stages; choir and three traves of the nave 1922-1923, two traves of the nave and the tower 1926-1927. House in an eclectic style, influenced by Classicism, with a chapel in neo-Gothic style. Three-aisled hall-church with dormer windows. No further details. The inventory of Te Riele's archive refers to Drammensveien, a long street. Straight choir in neo-Gothic style for an older neo-Classical church. Three-aisled basilica in neo-Gothic style, with front tower. Three-aisled basilican church in neo-Gothic style. Wide side-aisles with gables. Front flanked by polygonal turrets. To save on costs, the nave and the side-aisles had wooden roofs, and only the choir had vaults. Demolished c. 1982. Cruciform church in neo-Gothic style, with square crossing-tower. Practically identical to the church built in Lonneker in 1912. Extension of A. Tepe's church of 1880-1881 with three wide traves and a new front flanked by stair-turrets. 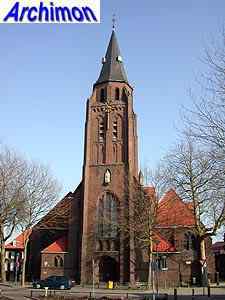 Church in neo-Gothic style, largely similar to the church in Koewacht. Tower next to the choir. Cruciform basilica in a neo-Gothic style inspired by early German neo-Gothicism. Already designed in 1915. Te Riele's only truly centralizing church. 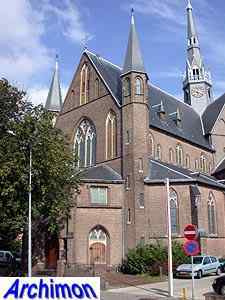 Neo-Gothic church modelled after Stuyt's St. Catharina in 's-Hertogenbosch. Front with flanking stair-turrets. Central space covered by a pointed dome. Demolished in 1973. Tower for A. Tepe's church of 1894-1895. Church demolished in 1977-1978, tower remains. Pseudo-basilican church in neo-Gothic style with hexagonal crossing-tower. 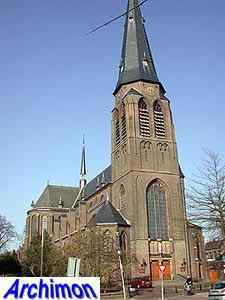 Big neo-Gothic church with two towers at the front and polygonal crossing-tower. 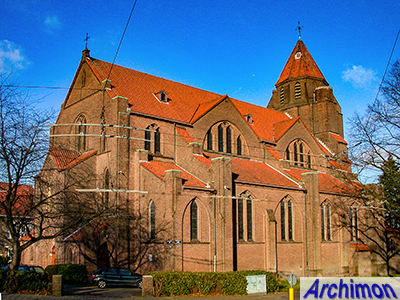 Extension of A. Tepe's chuirch of 1902-1904; nave lengthened and new facade. Church demolished in 1965. Three-aisled basilica in neo-Gothic style, with front tower. Destroyed in 1944. Choir in neo-Gothic style, replacing the original choir of P. Soffers' church of 1862-1863. Aisleless church with low but very wide nave and no externally recognizable choir. The church is covered by a single mansarde roof with two rows of large rectangular dormer-windows. At the south side an open bell-tower was built, which was later removed. 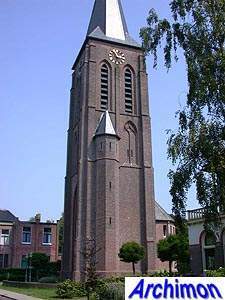 Instead a tower, not by Te Riele, was built at some distance at the front of the church. The church closed in 2012 and is now a day care center for children. Church in neo-Gothic style. Combination of a basilica and a centralizing ground-plan. Choir with tower. Design for a procession park with chapel. Design only, the project was eventually built by Te Riele's former employee H.W. Valk. Cruciform church. Rebuilt by J. Hurks in 1946 after having been damaged in the war, leaving only the original nave and choir. Three-aisled cruciform basilica in a style that features elements of both Expressionism and Traditionalism. Tower on top of the choir. One-aisled church. Frontal tower largely similar to the one in Easterwierrum. No further details. Design only. 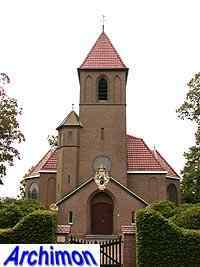 Instead a church designed by Karl Haake and Hans Tietmann was built. Three-aisled church in neo-Gothic style. Very wide nave with wide side-aisles. 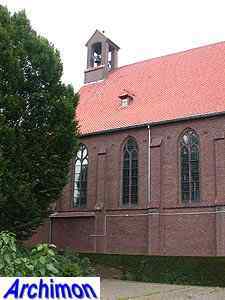 Instead of a clerestorey the nave had domer windows on two different levels, much like the St. Marien in Kamp-Lintfort. Square tower with octagonal upper segment. Badly damaged in 1944 and replaced later. Three-aisled basilica with polygonal dome and towers flanking the choir. Only the lower part of the western tower was built. Second transept, new choir with lateral chapels and sacristy added to an older church. Probably design only. Church destroyed in 1944. A mystery; except for the tower this church looks nothing like a Te Riele. Three-aisled church with tower at the side of the front. Expressionist details in the interior. The church was designed as part of a large complex and was probably built in 1931-1933. Te Riele's last church. Neo-Gothic pseudo-basilica with small bell-turret at the front.